Disc 1) Go to "Extras". Highlight "Animation Showcase". Press your Up button to highlight the Homer Fawcett Poster and press your Enter button for a cover of the Village Voice. Disc 1) From the Main Menu, choose "The Parent Rap". On the episode's menu, highlight "Play Episode" and press your Up button to highlight the screen of one of the video games. Press your Enter button for a clip with bonus footage and a scene with only the working dialogue track. 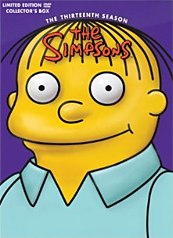 Disc 1) From the Main Menu, choose "Homer the Moe". On the episode's menu, highlight "Play Episode" and press your Up button to highlight the screen of one of the video games. Press your Enter button for a clip with bonus footage and a scene with only the working dialogue track. Disc 2) From the Main Menu, choose "Brawl in the Family". On the episode's menu, highlight "Play Episode" and press your Up button to highlight the screen of one of the video games. Press your Enter button for a clip with bonus footage and a scene with only the working dialogue track. Disc 2) From the Main Menu, choose "Brawl in the Family". On the episode's menu, highlight "Play Episode" and press your Up button to highlight the screen of one of the video games, then press your Right button to highlight another video screen. Press your Enter button for a clip with bonus footage and a scene with only the working dialogue track. Disc 2) From the Main Menu, choose "Jaws Wired Shut". On the episode's menu, highlight "Play Episode" and press your Up button to highlight the screen of one of the video games. Press your Enter button for a clip with bonus footage and a scene with only the working dialogue track. Disc 2) From the Main Menu, choose "The Bart Wants What It Wants". On the episode's menu, highlight "Play Episode" and press your Up button to highlight the screen of one of the video games. Press your Enter button for a clip with bonus footage and a scene with only the working dialogue track. Disc 3) Go to "Extras". Highlight "Animation Showcase". Press your Up button to highlight the Homer Fawcett Poster and press your Enter button for an article and cover of TV Guide. Disc 3) From the Main Menu, choose "Lastest Gun in the West". On the episode's menu, highlight "Play Episode" and press your Up button to highlight the screen of one of the video games. Press your Enter button for a clip with bonus footage and a scene with only the working dialogue track. Disc 3) From the Main Menu, choose "Weekend at Bernise's". On the episode's menu, highlight "Play Episode" and press your Up button to highlight the screen of one of the video games. Press your Enter button for a clip with bonus footage and a scene with only the working dialogue track. Disc 3) From the Main Menu, choose "Weekend at Bernise's". On the episode's menu, highlight "Play Episode" and press your Up button to highlight the screen of one of the video games, then press your Right button to hilight another video screen. Press your Enter button for an article and cover from Relix Magazine interview with Phish. Disc 4) From the Main Menu, choose "The Sweetest Apu". On the episode's menu, highlight "Play Episode" and press your Up button to highlight the screen of one of the video games. Press your Enter button for a clip with bonus footage and a scene with only the working dialogue track. Disc 4) From the Main Menu, choose "Poppa's Got a Brand New Badge". On the episode's menu, highlight "Play Episode" and press your Up button to highlight the screen of one of the video games. Press your Enter button for a clip with bonus footage and a scene with only the working dialogue track. Disc 4) Go to "Extras". Highlight "Animation Showcase". Press your Up button to highlight the Homer Fawcett Poster and press your Enter button for the DVD credits and memorium..